There will be some children who started school in September who aren't saying anything in school. Its always very difficult for a class teacher to know if its just shyness an underlying receptive language difficulty, an expressive language disorder or whether it could be selective mutism. Selective Mutism occurs when children who can speak and understand language perfectly normally at home are unable to speak elsewhere e.g. school or nursery. Unusually, there are many more girls who have selective mutism. It's also apparent that when boys display this condition they often have other social interaction or learning problems as well. Selective Mutism used to be known as elective mutism, as people including professionals believed that children were choosing not to speak, and were therefore thought to be challenging and manipulative. The term Selective Mutism reflects current understanding that the children’s silence is not something they can control. It can be seen as a type of extreme social anxiety or phobia. Michael Jones, specialist speech and language therapist has done a lot of work on this subject. This is an extract from his excellent article featured on his website. How does selective mutism (SM) develop? Michael says that 'SM can begin as shyness, but for various reasons children become progressively unable to speak in public, and especially at pre-school or in school. No single cause has been identified, though emotional, psychological and social factors may play a strong part. In some cases trauma can be an important factor, perhaps in school or hospital. Some children with SM are also anxious about new or unfamiliar situations and activities, and may be overly worried about taking risks. Children may have other behaviours, such as limited eye contact and facial expression, physical rigidity, nervous fidgeting and withdrawal. SM often develops as children get older. It may not always improve spontaneously, and in some cases can become an intractable condition that severely limits young people’s life chances. Early identification and appropriate support is of vital importance. If a child is not speaking at pre-school or school after a period of ‘settling in’ then a Speech and Language Therapist should be consulted. The most important form of help is to establish good links between home, school and any professionals who are involved. Maggie Johnson and Alison Wintgens, two Speech and Language Therapists, have produced a practical and comprehensive book about SM. ‘The Selective Mutism Resource Manual’ offers practical and effective strategies for helping children and young people with anxiety about talking in public. Their approach to developing confident speaking is a comprehensive guide to research and literature about SM, as well as offering effective advice to parents and professionals. Do you sometimes find yourself saying 'yes' then working out the practicalities later? I'm really bad at that, so when I was asked if I could devise a training programme for 2 year olds that could be delivered mainly without taking the staff out of the nursery or pre-school, similar to the Languageland Programme that caters for 3-7yr olds, I said.......... 'Of course!'. I enlisted the the help of Helen Stretton, and we set about working out a training package with a 6 week programme. There will be an initial training session without the children to set the scene and introduce the ideas that we're going to demonstrate. There isn't anywhere that pulls together the framework of communication and how everything fits together, so we'll start with that.We'll look at attention, listening, auditory memory, information-carrying words as well as vocabulary and other important concepts. Each of the 6 sessions following will see the therapist run the group and discuss why she is doing an activity. The staff will be able to follow with aim/activity sheets with explanations which tie in with what they learned in the first classroom session. There will also be sheets which give more ideas, further activity suggestions and useful books to back up what has been covered. We have designed it so that others can use it so there is a sheet for each session for the person delivering the session to suggest exactly how to deliver it for maximum effect. Helen is piloting it in September in Burton with a project working with staff from 2 pre-schools and a group of 2 year olds and their parents, funded by the Community and Learning Partnership. Lisa Griffiths, the Smart Talkers Franchisee from St Neots will do a second pilot in her area. The idea then is to sell it to other speech & language therapists or special needs co-ordinators so they can deliver the training in their settings. We have a publisher who is interested already. I read this on the BBC world service website (September 15th 2010). Not many children are reported to suffer from it but I'm sharing it because I think its fascinating! Englishwoman Kay Russell suffers from an extremely rare neurological disorder. After a serious migraine, she woke up with what sounds to many like a French accent. Her condition is known as Foreign Accent Syndrome. Dr Anja Lowit is from the University of Strathclyde's Speech and Language Therapy Department in Glasgow and is one of the few experts in Foreign Accent Syndrome. Signs serve as a visual cue of the new word’s meaning - Signs are often visually representative of the concept they represent. For example, when you sign BALL and say “pelota”, the sign is a great cue as to the meaning of the word because the sign for BALL actually looks like a ball! This is true for many signs. Signs serve as bridges helping children to find commonalities between language- In other words, a child may learn very early on that when you put your hands together (like the sign fore MORE) that means MORE! When you ask your child in the second language “Quieres Mas?” the first several times you might get a look from your child like “huh? !” But if you say “Quieres Mas?” while signing that familiar sign MORE, a lightbulb will go on!! Instead of “huh?” your child will likely be thinking “I’m really not sure what mom just said, but I know that sign means MORE and yes, I want MORE!” Over time as he hears “Quieres Mas?” and simultaneously sees the sign MORE, he will connect meaning to the phrase, increasing understanding and thus use of the new language. Adding signs to the mix will not confuse your child! It facilitates the process of understanding and using a new language. The is not only true for babies but for older children as well! This is just one of the many benefits of signing with a child! It’s a big decision to franchise a business and an even bigger one when it comes to choosing franchisees. I’m sure there are some businesses out there who are just after the franchise fee and who will the take on anyone with the right colour money but one of the reasons I wanted to franchise my business is that I wanted to spread the word about stimulating spoken language in pre-school children. It was very important to me therefore only to take on individuals with EXACTLY the right attitude and enthusiasm. I’m not looking for qualifications, just someone who knows it’s a privilege to work with pre-school children and who is passionate about communication. I say ‘just’, but the reality is, that the right people are probably few and far between. Since May when I started to franchise I’ve had so many enquiries from people who I have later interviewed (even with their full franchise fee in hand) who just wouldn’t be right sitting on the floor with a puppet and a group of children and their parents AND who can run their own business. I don’t think my ideal franchise is walking around a franchise show, I think they are likely to be a parent who has had time off from their job and doesn’t want to go back to that career or someone who has returned but is finding it tedious and hard to juggle with a family. They’re probably not looking for a franchise and haven’t heard of pre-school communication groups. I put an advert on Face book as I thought that someone who was fed up might be complaining to friends about their plight, perhaps with a glass of wine in hand, maybe late at night. What a good move! It worked perfectly and we now have Lisa Griffith and her team on board from Cambridgeshire. Lisa will offer Smart Talkers services to nurseries throughout Cambridgeshire and some parts of Bedfordshire. There are lots of different opportunities but all to help develop speech, language and communication in pre-school children. General language stimulation sessions with songs, games and language based activities. Lisa has good relationships with nurseries as she was previously a placement co-coordinator for a local college for students studying child-care. She will work with Nicky, Barbara and Laura to run Baby Talk with midwife groups and teenage parent groups and is negotiating with Sure Start to implement Small Talker and Tiny Talker classes in Childrens’ Centres. She will also arrange training courses for local staff which the Small Talk Speech Therapy Team will run ... so she really can deliver the whole Smart Talkers' package! They have a series of open evenings planned next month to invite local professionals to tell them what Smart Talkers Cambridgeshire can do. I’m going to the first one to lend my support. Each franchisee will choose their own parts of the package to do as many or as few classes as possible so that it fits perfectly with their individual family life. Lisa and her team are probably exceptional in wanting to deliver as much of the available options as possible. I’m as excited as they are. We had so much fun doing the training it didn’t feel remotely like work! We’re meeting up again next Saturday to go through the session plans and some more signing...... watch this space!! Will Teaching My Baby Sign Language Delay His Speech? 1) SIGNING IS NATURAL - If you think about it, babies learn naturally to gesture. They throw their hands up in the air to indicate "up", they clap to indicate "I like that! ", they point to express "I want that". Signing with a baby expands on this already present intuitive means of early communication. 2) SIGNS ARE A BRIDGE TO SPEECH - Much like crawling is to walking, gesturing/signing is to speech. Crawling is a natural first step enabling a baby to explore her world before she is ready to walk. Signing empowers your child to communicate before she is ready to talk. Babies don't decide to forgo walking because they already have a method of moving around -- when their bodies are ready, they will walk! A point in time comes when walking becomes more effective than crawling. The same is true for signing and speech. Ultimately when your baby is ready, speech will more effective than signing. 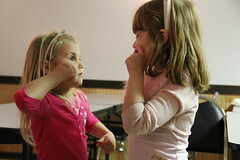 Just as babies gradually move from crawling to walking, signing babies eventually transition from signing to speaking. 3) SIGNING READIES A BABY FOR SPEAKING - Oh how I love to think about, write about, chat about the many ways signing prepares a baby for speaking. Signing families are very focused on communicating and thus spend a great deal of time in face-to-face, language-rich interactions with baby. As parents are signing with their baby, they use lots of repetition of both the signs AND the spoken words (speaking & signing should happen simultaneously). They talk about the objects they are signing about, and repeatedly show these objects to baby, demonstrating how those objects are used to keep the baby's interest. All this practice with language and words results in signing babies having broad receptive vocabulary knowledge. The rest is like dominoes: The earlier a child understands a sign the sooner he can use the sign, the more signs he uses the more words he can speak when his little mouth, tongue and lips are ready! It also should be said that signing babies have the advantage of participating in give-and-take conversations much earlier than babies who don't sign. This too readies a child for spoken communication. All of these things come together to lay the foundation for speech. It's like all of the pieces are ready and waiting and as soon as a baby is able, speech will take off! Certainly there are times when even a signing toddler has delayed speech. But it's NOT likely the signing that has caused this. In fact, for the reasons stated above, one of the first things a SLP will do with a child who is late to talk is teach them to sign! And for those families who do have a child with delayed speech, I encourage you to think about the ultimate goal of signing and speech: COMMUNICATION. I can assure you that many a family with a late-talking, signing child has thanked their lucky stars that their child could express himself in some way, alleviating so much frustration from breakdowns in communication. Ultimately, signing will NOT cause your baby to have delayed speech. It WILL be one of the best things you do to help prepare your baby for talking! The Small Talker Groups were set up exactly to try to help alleviate the problems faced by the Class Teacher. We work on everything they need to be successful, effective communicators including attention, listening, vocabulary, understanding, expressive language skills and social interaction. I know I'm rapidly approaching 50, so I probably qualify for the role of grumpy old woman but what I saw today made me not only angry but very sad. I'd taken a break from work to have my nails done in Rugeley. It's a small market town which is suffering more than its fair share of the recession. There is a wealth of charity shops and many boarded up pubs but the level of socio-economic well being in general is much the same as elsewhere. They had the door open because it was warm, so for an hour and a half while I was sitting in the chair 'being done', I could hear the general hum of human activity as families, teenagers and a good sample of the general population passed by on their way to the market hall or the bus station on a warm summer afternoon. Sounds peaceful, a slice of England going about its business? NO!! It might have been a sample of society on a summer afternoon but what I heard was most upsetting and made the whole session quite stressful. At least 3 children crying and being screamed at from a very close proximity to either 'Shut up', or 'Shut the f@&k up' in one instance to a little boy who couldn't have been more than 18 months old. One 2 year old got a smacked bottom because he dropped his dummy (yes dummy, why on earth they need dummies at that age in the middle of the afternoon!). There was a loud, heated argument between a couple in front of their bemused 3 year old with too many swear words to mention and a teenaged mum with a cigarette hanging precariously over her newborn. I could go on but I won't. WHAT IS HAPPENING TO SOCIETY? Are we so stressed, caught up in our own world of problems that we have forgotten how precious and in need of nurturing our children are. We have a national crisis where parents are not adequately interacting with babies and children which leads to social interaction difficulties, language and communication problems. At least 40,000 children will have started school this week without the necessary levels of spoken language ability to access the curriculum. These are NOT children with speech, language or communication disorders which they have through no-one's fault, these are victims of what is, in reality, negligence. Had they had better parenting they'd be fine. I am not condemning just families with low income, as some of my most language deprived children who I see come from very affluent families. Conversely, some people I know are struggling on very low income but are fantastic parents. We must keep trying to spread the word about good practise but its going to take a long time. I was discussing social change with a friend, we were discussing the fact that everyone wears a seatbelt now and we all know that we shouldn't drop litter. These were two very powerful social messages that various governments managed to sustain. We need one now, about something I think is more important than both of those put together:how we should be talking to our children, valuing them, listening to them and showing them a good example.